...well not really, but he certainly looked like one. Tristan has been into that copycat stage, especially when it comes to Mommy and Daddy. 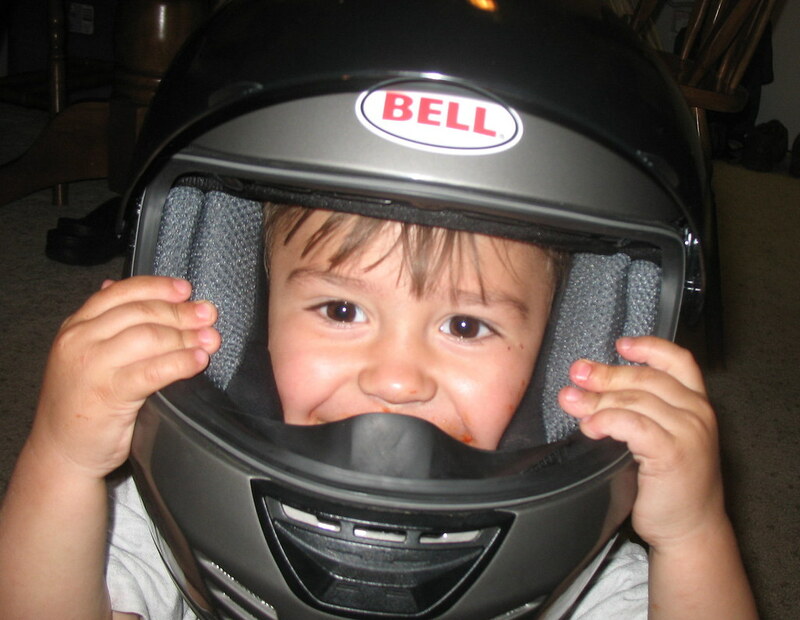 Well, Daddy drives a motorcycle, which Tristan so gladly points out in the morning when we head out. One part of Daddy's ensemble that Tristan absolutely loves is Daddy's helmet. 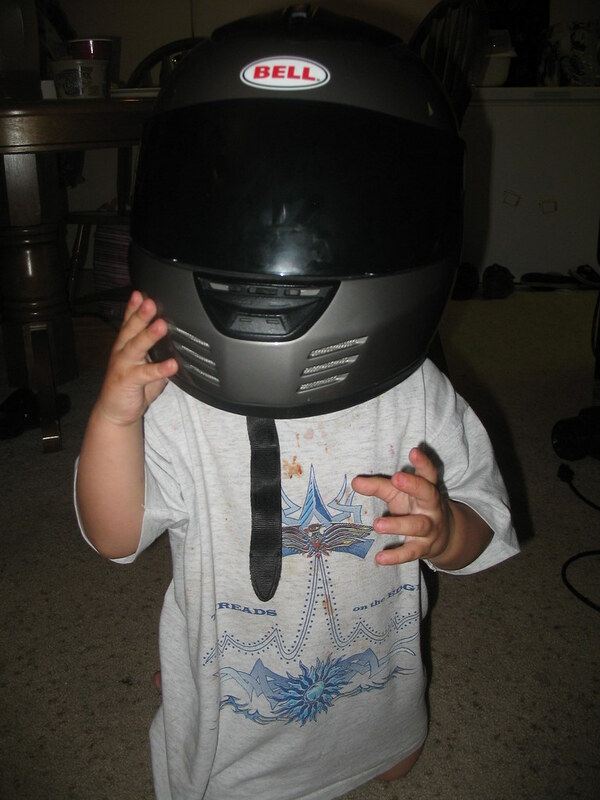 "I want on" he says, as he attempts to bring the helmet to either me or Daddy. We first thought that he wouldn't like having it on his head (not much stays on his head - his helmet, his hat, etc). How wrong we were! He had a blast running around the living room with "his" helmet on. Who's that inside that helmet? Bobble head Tristan! I am officially in my third trimester. Twelve weeks left! While time may have flown right by, it seems to be going on forever. I can't wait for baby girl to arrive. She's been kicking and turning inside me. Her movements have been growing stronger and stronger. My belly has been growing bigger and bigger. This pregnancy has been harder than the last. Mostly because I weigh more and I'm way out of shape. I get tired sooner, my back aches more, and there are other symptoms that have made daily life somewhat difficult and miserable. I must be pumped up with hormones, too, because I cry so easily now. Just one small thing might get the waterworks started. I lose my patience much easily now - which isn't good as far as parenting goes. Fortunately, we have a good son and he's mostly well behaved. And my impatience hasn't led me to spank him or anything (we decided to not spank our children before Tristan was born - we'd prefer not to teach them that hitting, no matter how light of a spanking it might be, is not an option). I only might get upset with him sooner and sometimes get upset with him for little things. My biggest issue with him, though, has been his rambunctious nature, especially when it comes to me. He loves to jump, climb, and play with Mommy and Daddy. However, no matter how many times we tell him to be gentle with Mommy and her "baby belly", he doesn't seem to understand. So, I am just extra careful with him around. I don't want to push him away, especially as a new member of this family is about to make her entry. Tristan still needs Mommy time, too. I just did my glucose test yesterday, so we'll see if I have gestational diabetes. Hopefully, I don't have to worry about it. Now that I'm going every two weeks, I'll find out sooner.